A graphene-based coating under development at UB keeps a piece of steel rust-free (foreground), in stark comparison with a rusted sheet of steel (background). Scientists at the University at Buffalo are developing a graphene-based composite that will hopefully serve as a rust-proofing alternative to the toxic coatings that are now being used. The researchers believe graphene’s hydrophobic and conductive properties may help prevent corrosion, repelling water and stunting electro-chemical reactions that transform iron into iron oxide. Buffalo, New York — University at Buffalo researchers are making significant progress on rust-proofing steel using a graphene-based composite that could serve as a nontoxic alternative to coatings that contain hexavalent chromium, a probable carcinogen. In the scientists’ first experiments, pieces of steel coated with the high-tech varnish remained rust-free for only a few days when immersed continuously in saltwater, an environment that accelerates corrosion. The UB chemists leading the project are Sarbajit Banerjee, PhD, an assistant professor, and Robert Dennis, a PhD student. 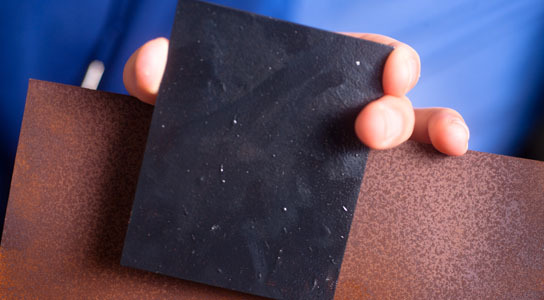 Their next step is to use a $50,000 grant from the New York State Pollution Prevention Institute to enhance the graphene composite’s lasting power, as well as the quality of its finish. Tata Steel, an international company that has provided past funding for Banerjee’s projects, has been helping the scientists test larger sample sizes, Banerjee said. Bringing the coating to the market could not only benefit public health, but also save jobs, said Dennis and Banerjee. Graphene, the thinnest and strongest material known to man, consists of a single layer of carbon atoms linked in a honeycomb-like arrangement. UB researchers are developing graphene-based anti-corrosion coatings. Here, three solutions for rust-proofing steel contain varying amounts of graphene. 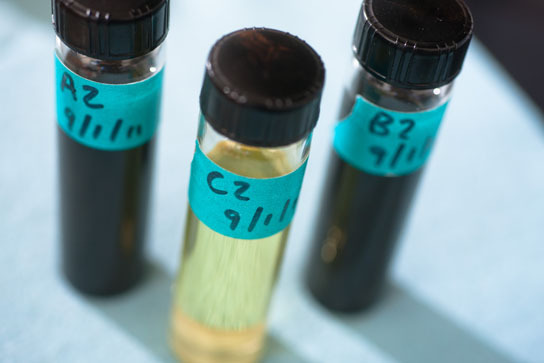 The material’s hydrophobic and conductive properties may help prevent corrosion, repelling water and stunting electro-chemical reactions that transform iron into iron oxide, or rust, Banerjee said. UB’s Office of Science, Technology Transfer and Economic Outreach (STOR) has submitted a provisional patent application to protect the coating Banerjee and Dennis are refining. As sponsors of the research and due to inventive contribution by Tata employees, Tata Steel also has certain rights to the technology. “Tata Steel has always displayed leadership in motivating innovative research and product development by leveraging partnerships with universities. UB has been one of our choices for cutting-edge coatings technology development on steel substrate,” said Debashish Bhattacharjee, PhD, Tata Steel’s group director for Research, Development and Technology. The New York State Pollution Prevention Institute, headquartered at Rochester Institute of Technology (RIT), is a partnership between RIT, Clarkson University, Rensselaer Polytechnic Institute, UB and the state’s network of Regional Technology Development Centers. Banerjee, a materials chemist, has worked closely with industry and STOR to commercialize his research since joining UB in 2007. In addition to his work on graphene, Banerjee has spoken to companies in the building materials industry about his research on vanadium oxide, a synthetic compound that could be used in “smart” windows that reflect heat from the sun only on hot days. “UB 2020, our university’s long-range plan, asks faculty to take an active role in translational research, and our rust-proofing project is an example of research that benefits communities on both a global and local scale,” Banerjee said. Be the first to comment on "Graphene Based Composite Being Developed as Rust Proofing Alternative"